Since last Valentine’s day the most popular posts on my pages have undoubtedly been from the series “Love Poems You Wish You had Written,” including this article featuring E. E. Cummings and why his name should be properly capitalized. And if this lights your valentine fires, please see Suzie Grogan’s blog, No Wriggling Out of Writing, in which she was doing a parallel companion series. So this year over Valentine’s weekend I thought I’d bring you a couple of love songs that I wish I had written. 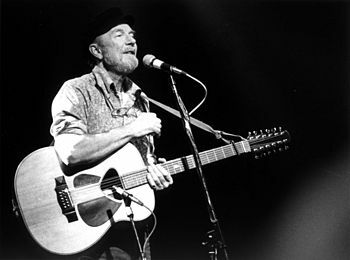 Today’s is in honor of the legendary folk singer Pete Seeger, who passed away in January at the age of 91. The Rolling Stone posted a little gem of an article this morning which features about ten minutes of “recently unearthed Pete Seeger footage” from a 1961 documentary “Wasn’t That a Time?” Brothers Michael and Philip Burton, the producers of the film were obviously Seeger supporters, but I find it sad that even believers in peace could be so cynical as to describe him as “idealistic to an unrealistic degree,” as if it was perhaps something naive to be “community-minded, obsessed with curing social ills through music.” That sounds like a pretty worthwhile obsession to me. His vision of peace was far ahead of his time, but time will tell whether or not such dreams are unrealistic. I see no value in giving up hope. And so appropriate to this day of hearts and love. Listen to Arlo Guthrie, son of Woody Guthrie, and patron saint of “Alice’s Restaurant” tell the story. And watch Pete Seeger and his grandson Tao sing along in this live concert clip from a few years back. What a wonderful Valentine’s Day present!